The G1416 covert body wire was designed to monitor conversations with minimal interference over long distances. Unforeseen environmental problems such as weather disturbances, land obstacles, or distortion due to fast movements generally do not hinder the performance of our body wires. 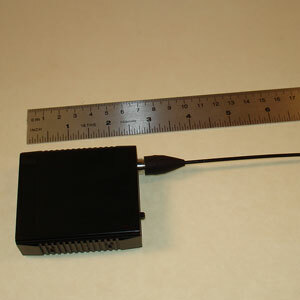 The concealed transmitter is built into a box for optimum durability and will withstand severe movements. The G1416 Body Wire transmitter broadcasts powerful, clear sound even to receivers located far away. Portable and lightweight, compatible with a full range of radio receivers, this audio surveillance transmitter is a sound choice for high powered transmission. The G1416 option employs an extra high sensitivity circuit which allows the user to pick up sound from up to 50 feet away (conditions permitting). It is now available with 7 frequencies.